The central dogma of molecular biology states that the flow of genetic information is unidirectional, that is; DNA to RNA (transcription) to protein (translation). In higher eukaryotes however, gene expression regulation is extraordinarily complex and such a unidirectional flow of information cannot adequately explain the biological complexity required by higher organisms to modulate protein production. Small RNAs (sRNAs) , processed from double-stranded RNA (dsRNA) triggers, are a class of regulatory molecule that flow in the opposite direction to the central dogma of molecular biology, directing RNA-RNA and RNA-DNA interactions, to control and regulate gene expression. My research focuses on discovering roles for the five members of the Arabidopsis thaliana (Arabidopsis) dsRNA binding (DRB) protein family in sRNA biogenesis (nucleus, production stage) and sRNA target gene expression regulation (cytoplasm, action stage). The mechanisms of; i) sRNA production, and; ii) sRNA action, are extraordinarily complex, and unsurprisingly, many of the protein machinery components involved in sRNA biogenesis, or the intricacies of the mode of sRNA target gene expression regulation, remain to be determined. In this context, my recent discovery that all five Arabidopsis DRBs (DRB1 to DRB5) function in the closely related and developmentally important sRNA-directed RNA silencing pathways, the microRNA (miRNA) and trans-acting small-interfering RNA (tasiRNA) pathways, has opened up this field to rapidly progress our understanding of sRNA production and action in plants. DRB1, DRB2 and DRB4 are nuclear proteins required for miRNA and tasiRNA sRNA processing from much larger dsRNA precursor templates. This dsRNA interaction is mediated by the first of two dsRNA binding motifs (DRMs) encoded by each Arabidopsis DRB protein. The second DRM mediates protein-protein interactions, namely formation of a functional partnership with a Dicer-like (DCL) endonuclease: nuclear DRBs ensure that their partnering DCL is positioned correctly on the dsRNA template for accurate and efficient sRNA production. DRB1 is required by DCL1 to process miRNAs from imperfectly dsRNA stem-loops (fold-back structures of non-protein-coding miRNA precursor transcripts), and DRB4 is required by DCL4 to process tasiRNAs from perfectly dsRNAs: products of RNA-dependent RNA polymerase6 (RDR6) activity, following miRNA-directed cleavage of non-protein-coding tasiRNA precursor transcripts (see Figure 1). More recently, DRB2 has been shown to function in both the miRNA and tasiRNA pathway to suggest, that unlike DRB1 and DRB4, DRB2 can; i) bind imperfectly and perfectly dsRNA, and; ii) interact with DCL1 and DCL4. Following their maturation, miRNA and tasiRNA sRNAs are exported to the cytoplasm and loaded onto the Argonaute (AGO)-catalysed RNA-induced silencing complex (RISC). AGO uses the loaded sRNA as a guide to identify, bind, and subsequently cleave complementary mRNAs to regulate sRNA target gene expression (see Figure 1). DRB3 and DRB5 are cytoplasmic and regulate the expression of DRB2-dependent miRNAs, independently of target messenger RNA (mRNA) cleavage, the predominant mechanism of sRNA-directed RNA silencing in plants. 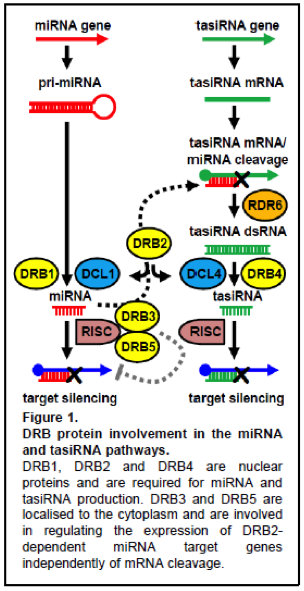 Furthermore, and unlike the global requirement for DRB1 and DRB4 activity in the miRNA and tasiRNA pathways respectively, the involvement of DRB2, DRB3 and DRB5 in either the production or action stages of these two Arabidopsis sRNA pathways, is restricted to specific tissues (shoot and floral meristems) and dsRNA precursor structures. Taken together, these results suggest that DRB2, DRB3 and DRB5 function in a tissue-specific non-canonical miRNA pathway in Arabidopsis and the continued functional characterisation of this pathway forms the research focus of my Lab within The Centre for Plant Science at The University of Newcastle. I am currently seeking enthusiastic and motivated undergraduate (summer scholarships) and postgraduate (Honours and PhD Research Higher Degree applicants) students to contribute research to this exciting and expanding area of sRNA biology. DRB3 and DRB5 cellular localisation: static or dynamic? In the canonical miRNA pathway of Arabidopsis, miRNAs processed from their precursor transcripts by the DRB1/DCL1 functional partnership in the nucleus are exported to the cytoplasm and loaded onto AGO1-catalysed RISC. AGO1 uses loaded miRNAs as sequence specificity determinants to identify, bind and subsequently cleave complementary mRNAs, to regulate the expression of DRB1-dependent miRNA target genes. Molecular and phenotypic characterisation of drb2, drb3, drb5, drb23, drb25, drb35 and drb235 knockout mutant plants (plants defective for DRB2, DRB3 and DRB5 activity), suggests that the expression of DRB2-dependent miRNA target genes is regulated independently of mRNA cleavage. I have therefore focused my attention of three additional Arabidopsis AGO proteins that have unique mRNA cleavage domains to AGO1. Genetic crossing between drb and ago knockout mutant plant lines strongly indicates that these three AGOs, and not AGO1, are required to regulate the expression of DRB2-dependent miRNA target genes. Complete molecular (assessment of precursor transcript processing efficiency, mature miRNA accumulation and miRNA target gene mRNA and protein levels) and phenotypic (establishing at what developmental stage these alternate DRB/AGO pathways function) assessment of these drb/ago combination knockout mutant plants is required for further functional characterisation of this tissue-specific non-canonical miRNA pathway. Nuclear DRB/DCL functional partnerships are crucial for accurate and efficient sRNA production in Arabidopsis (see Figure 1). Historically, DRB1 and DRB4, in functional partnership with DCL1 and DCL4 respectively, were believed to be the only requirement for miRNA and tasiRNA production from imperfectly and perfectly dsRNA precursor transcripts. However, the accumulation (sRNA production efficiency) of specific miRNA and tasiRNA subsets changes dramatically in the drb2 single mutant plant to suggest that DRB2 is also required for the production of both of these developmentally important sRNA species. This finding is further supported by my demonstration that constitutive expression of DRB2 outside of its wild-type expression domain in the drb14 double mutant (plant line defective in miRNA and tasiRNA production) fully complements the severe developmental phenotype expressed by this double mutant (see Fig. 2). Furthermore, I have been unsuccessful in generating a drb124 triple mutant plant (plant line defective in the activity of all three Arabidopsis nuclear DRBs) following numerous attempts by standard genetic crossing. I have however successfully generated heterozygous/homozygous combination knockout mutant plants, including the drb1124, drb1214 and drb1241 plant lines, all of which express developmental phenotypes of much greater severity than the double mutant plants (drb12, drb14 and drb24 double mutants) used in these genetic crossing experiments (see Fig. 2; compare panel columns 2 to 3). Taken together, these results suggest that all three nuclear DRBs are required for miRNA and tasiRNA production and that these two sRNA species are an absolute requirement for plant viability. I am therefore taking a molecular and phenotypic approach to determine at what stage, or stages, in embryo development, lethality occurs in the drb1124, drb1214 and drb1241 mutant plant lines. DRB2, DRB3 and DRB5 cellular localisation: static or dynamic? I have previously shown that DRB3 and DRB5 are expressed in the cytoplasm of the plant cell. Curiously however, my recent molecular analyses revealed that the accumulation of a small number of miRNAs is altered in drb3, drb5 and drb35 knockout mutant plant lines. Changes in accumulation of these miRNAs were only observed in tissues where DRB3 and DRB5 are expressed in wild-type plants. This suggests that in specific tissues, and depending on the presence of specific dsRNA precursor transcripts, DRB3 and/or DRB5 may relocate to the nucleus to assist in the production stages of the miRNA pathway. 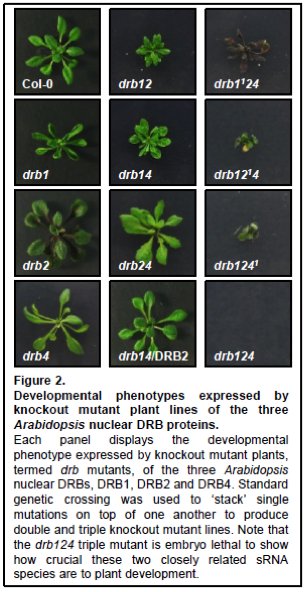 I have therefore generated a series of fluorescently-tagged versions of DRB3 and DRB5 (and of DRB1, DRB2 and DRB4 as static nuclear-localised controls) to determine if the cellular localisation of DRB3 and DRB5 is static or dynamic in specific tissues of the Arabidopsis plant in the presence or absence of structurally unique dsRNA precursor transcripts. For further information on any of the above listed projects or to chat on plant sRNAs in general please contact Dr Andy Eamens.